Perhaps you are miserable, are ill, worried about your health, lethargic or have long term illness? The audios in this healing series assist pain relief and bring natural help for your immune system. Find your beautiful garden, relax, let The magic light in. This is totally natural medication listen as often as you need soothing comfort and rest. 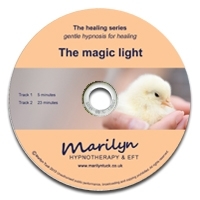 The magic light, like others in this hypnotherapy healing series, offers relaxing healing whenever needed. This is totally natural medication. Use The magic light alongside others in the hypnosis healing and sleeping mp3 series to relax, balance and heal.